Seattle, Wash. (November 1, 2016) – The Seattle Southside Regional Tourism Authority (RTA) unveiled a holiday travel guide for the 2016 holiday season. 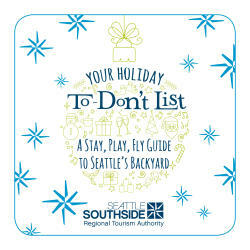 The RTA created the holiday travel guide to promote convenience for travelers leaving from Sea-Tac Airport as well as to showcase all things holiday related in Seattle Southside. The holiday travel guide, cheerfully titled “Your Holiday To-Don’t List: A Stay, Play, Fly Guide to Seattle’s Backyard,” explores several topics including: the to-don’t list of holiday travel, several Seattle Southside itinerary suggestions, area holiday events and a gift guide featuring unique items from Seattle Southside’s boutique shops and attractions. Travelers departing from Seattle-Tacoma International Airport, are encouraged to visit Seattle Southside a day early and stay in one of the area hotels before flying out. By booking a hotel room close to the airport, travelers can take advantage of several Park, Stay, & Fly packages to ease the stress and hassle of travel before departure. Shuttle transportation to and from the airport and the cost of parking included in an overnight stay make an affordable alternative to parking at the airport. By staying near the airport a day early, holiday shopping can be wrapped up, the kids can release some steam, parents can relax and everyone can enjoy the international dining scene. Along with the countless other family friendly activities in the area, Seattle Southside makes for the perfect pre-trip holiday adventure. The guide features several dozens of Seattle Southside’s finest restaurants, attractions, and shops including but not limited to: iFLY Indoor Skydiving, The Museum of Flight, Westfield Southcenter, The Spa at Cedarbrook Lodge, Seike Japanese Garden, Salty’s at Redondo, Star Coffee, The Scotch & Vine, and many more. The vast selection of things to do in Seattle Southside detailed in the guide, works to accomplish the primary goal of promoting area Park, Stay, & Fly packages. The Seattle Southside holiday travel guide can be downloaded for free here.